Down Town Bingo is the perfect online site to play Bingo and have fun. This Bingo hall was established in 2014 and one can play vast collection of Bingo games as well as pokies, poker games and Keno games. With outstanding themes and graphics playing Bingo and other pokies is so exciting even with mobile be it iOS or Android. What’s more there is awesome $1500 welcome bonus for new bingo players at this online bingo site plus hundreds of other bonuses from time to time. 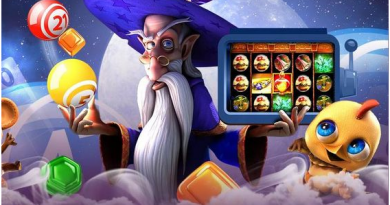 The games of Bingo and pokies are powered here by Vista gaming who is an award winning brand in the online entertainment space since 1996, and focused on the Bingo and Casino verticals. Note that though the Downtown Bingo accepts Aussie players but you need to make a deposit in USD or Bitcoins to play Bingo here. There are lots of Bingo variety as well as other casino games to play like Video pokies, Video Poker, Chain reactors and Casino table games. The vast collection of games which includes infinite 75 and 90 balls Bingo games, 12 exciting table like Roulette and Blackjack, as many as 31 Video Poker games, Keno Games and over 100 Video pokies are going to keep you entertained and will quench the never ending thirst for eGaming with games like Joker Poker, Legends of the Sea, Sugar and Ice and Zodiac. You can now create your own unique Bingo Cards which allows you to choose your own lucky numbers and create your own personalized custom Bingo Cards. Reuse them every time you play and win big playing your own lucky numbers. Custom Cards can be used every time you play Bingo75 at Downtown Bingo. Once you’ve created your new Custom Bingo Cards, you can use them every time you play your favorite 75 ball bingo games. How to get started to play Bingo at Down Town? 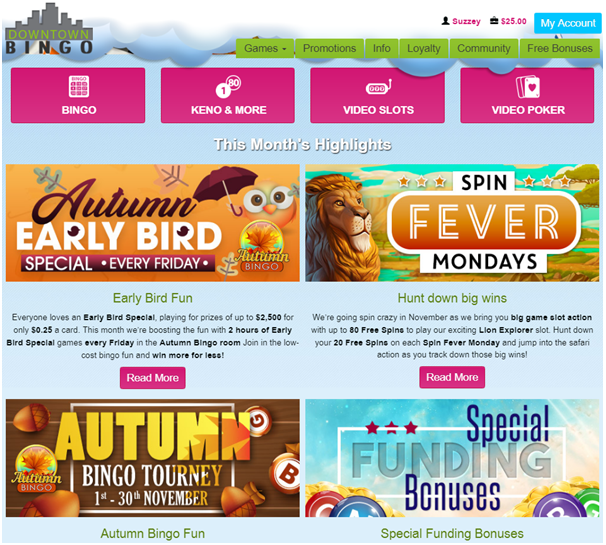 To get started all you need is to visit the Downtown online Bingo site with your mobile or PC or Tablet. As they offer Instant play games you needn’t download anything. To play, all you need is an Internet connection of 56K or better and a common browser like Internet Explorer 9, Mozilla FireFox or Google Chrome. Click on Sign up or Join Now button or Register Here button from the homepage and register yourself at the site to play Bingo instantly. You can purchase individual tickets or Bingo cards from as low as $0.05 to $5.00 each (or as otherwise offered). Players can purchase as little as 1 (one) ticket or card to participate in a game. 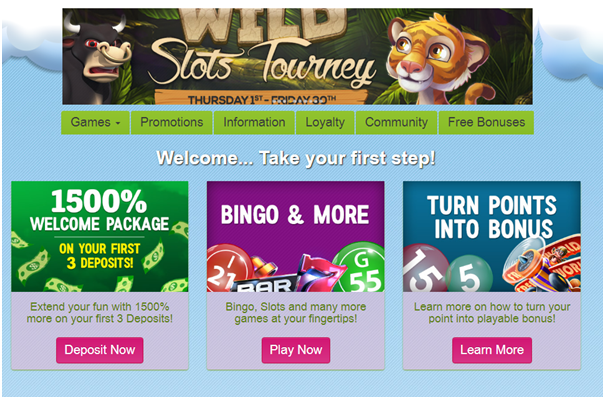 Players can purchase up to 120 tickets or 120 cards depending on the Bingo Game being offered. Join Bingo Rooms to Win wonderful cash prizes. 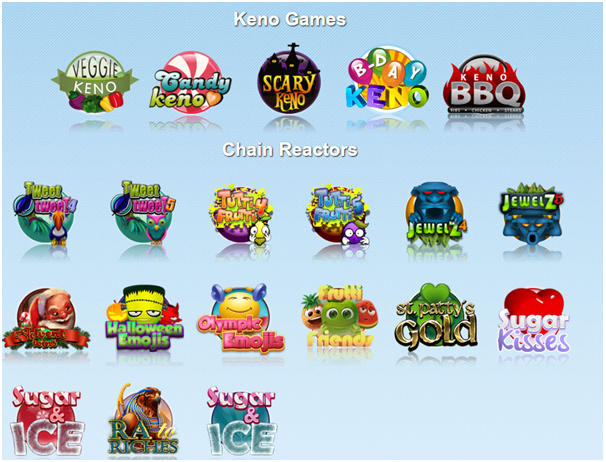 There are many Bingo rooms to join or play pokies of your choice in real time. 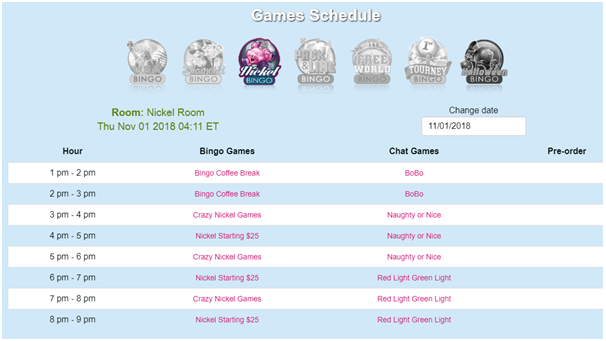 Nickel Bingo room: You can opt to play in the Nickel Bingo room between 1:00 pm EST to 9:00 pm Est and win fantastic prizes. Choose any one out of three low cost Bingo b75 offers that appeals you and win exciting prizes. Bingolicious Tourney: Join the Bingo tourney room between 8:00 pm Est to 11:59 pm EST and get a chance to win the $300 cash prize if you play the most games the entire every Friday. There’s more, be a part of the free game and win up to $1000 cash prize. All the prizes will be credited the next day and the top 10 players will be rewarded. Fantasy Bingo Tourney: Play between 8:00 pm EST to 11:59 pm EST and get a chance to win the gigantic amount of $15000 every Saturday night or Party along Unicorns and dragons as you play and win the most games to win a cash prize of $300. Top 30 players will be rewarded. The winners must be in top 10 during the entire time span of 30 days, offer valid only on certain games which must be checked before you start playing. Speedie Bingo Fun: This one is for all the Speedie fans out there, play any Speedie games between 4:00 pm EST to 6:00 pm EST and between 4:00 am EST to 6:00 am EST. Indulge in Coverall games in the seasonal bingo room that may beg you a cash prize up to $5000. With a minimum card cost of $0.35 and the minimum prize of $10 that grows with players wagers, be a part of the exciting games with a greater chance to win. You get 3 bingo cards free every time you buy 6. Catapult Bingo: Win $500 cash prize every Tuesday in the seasonal bingo room with the Catapult Bingo. The prize will start with the minimum cash prize of $50 after which the catapult will come in to action catalyzing the prize amount to the maximum $500 which will stay only for 3 calls before the catapult stops dropping down the prizes again. 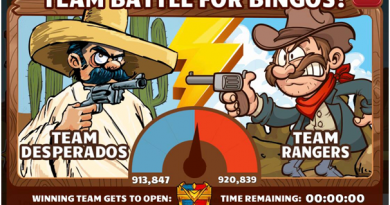 Get a chance to be a part of this amazing Bingo with a card cost of bare $0.05. A similar thrilling experience is also provided by the Bungee Bingo every Thursday between 9:00 pm EST and and 10 :00 pm est in the seasonal bingo room and the Roller Coaster Bingo every Wednesday in the same bingo room at same time. To Go Prizes: Play in the seasonal bingo room between 6 pm EST to 7:00 pm EST and let nothing but the luck decide who wins. Every games has a set number of cards required with the same card cost. The first three players may win a amount between $5 to $100 depending upon the game as destiny alone decides who is going to take away the prizes. Reverse Coverall Games: Make Bingo a bit more exciting with the exciting reverse coverall games in the seasonal bingo room between 9:00 pm EST to 10:00 pm EST every Saturday. With a card of mere $0.75 get a chance to win the maximum winning prize of $500 starting from minimum $50. Multipart Bingo Games: Win some dazzling cash prizes in the diamond bingo room every Tuesday, Wednesday and Thursday between 6:00 pm EST to 12:00 am EST. The games will be played in rotation with a card cost ranging between $0.25 to $0.75 that can help you win a cash prize up to $50 which will grow with the players wagering. To add to all this fun get 3 bingo cards absolutely free every time you buy 6 cards. USA Bingo Room: This amazing bingo room brings for you exciting offers to win every Sunday and Monday Play the Coverall or the reverse games with a card cost of minimum $1 and get lucky as you win the grand cash prize of $500 or a cash prize of $150. 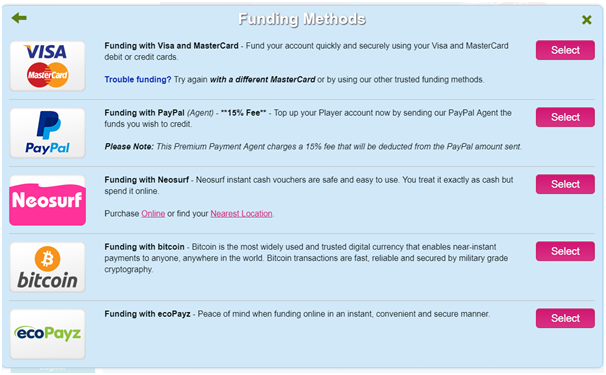 For your convenience, Downtown Bingo provides several different methods for you to choose from to fund your account including VISA/MasterCard payment options, Neteller, Neosurf, Bitcoins, PayPal, Ecopayz and others. Simply find the one that best suits your needs. The minimum amount for deposits is $25.00 and new players will be limited to $100.00 maximum per day. A higher daily deposit maximum can be requested by sending the following information to manager@downtownbingo.eu & accounting@downtownbingo.eu. A scanned bank statement clearly stating your name, last name, address, and bank account number where you intend to receive future withdrawals. Downtown Bingo processes payout requests two full business days after you submit your request. Any win or payout amounting to $2,500 or more must be accompanied by a picture and quote (100 words) from the player. All wins or payouts exceeding $5,000 must be accompanied by a picture, quotation and valid photo identification. The photo ID must have the same address listed on the player’s profile. By accepting a ‘cash-out’ members agree that their pictures and quotes may be used for internal and external advertising purposes. Furthermore, players may be required to provide a 20-30 second video testimonials and to sign a release and consent form. With SSL encryption it provides a safe and secure banking for flawless transactions which makes the gaming experience more thrilling. Get a very generous 500% on your first deposit on any amount as little as $25! On your third deposit you are entitled to a fabulous 400% bonus on any amount as little as $25! Also get Special Funding Bonuses every single day of the week that are valid for all players and available 24/7. The daily and weekly offers like Bingolicious, Catapult Bingo, 1 to go prizes and infinite others are surely going to keep fueling up your pockets. They also offer a unique Loyalty program. For every dollar you deposit in your account via one of their funding options, you will receive points. Over time, you can redeem these points for cash or other prizes as made available. Down town Bingo offers 24.7 help support to Bingo Players. You can either have a live help with Live chat or generate a help ticket by using the form at help page. A support person will respond within 30 minutes, 24 hours a day, 7 days a week. 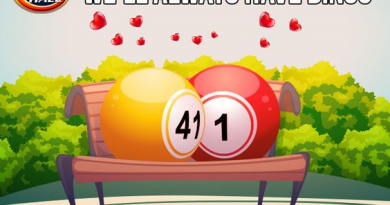 Players requesting assistance with a particular game must provide the following information within 48 hours of the game being played: The game number and pattern of the Bingo game at issue, The jackpot amount and any other peculiarities or details pertaining to the game. Also you can email at support@downtownbingo.eu for any general enquiries or at chat@downtownbingo.eu for any chat related issues or at accounting@downtownbingo.eu for any withdrawal related issues.